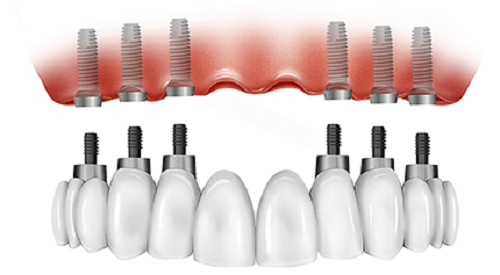 Maybe an all-on-four or all-on-six dental implants procedure is what you need if you are missing all your teeth in either the upper arch, lower arch, or both. Decades of research and success stories shows this is the very best option to restore an arch of missing teeth. 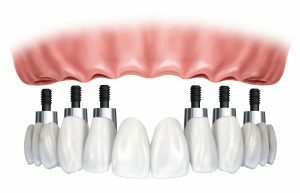 A dental implant is a titanium screw which is totally bio-compatible with the body and replaces the root of a missing tooth. This treatment normally includes placing four or six dental implants in one arch, which is where we get the term ‘full mouth dental implants’. These dental implants support a full bridge of teeth or a custom made, fixed hybrid denture, meaning you can bite apples, chew steak and smile as you used to, living a completely normal life again with fixed, permanent teeth. To proceed with the all on six dental implants treatment, your first trip to Lima should be for seven to ten days. This is when all the diagnosis is done during an appointment of approximately 60 – 90 minutes. Once the diagnosis is complete, a treatment plan will be recommended to you and treatment can begin on the same day. This involves the surgical stage and dental implant placement for the all on six procedure. The dental implants are placed while you are sedated so that you are very comfortable. For the four or six implants to be placed, you can expect this to take around 2 – 3 hours in total. Healing normally takes 3 months. This means that the bone integrates with the dental implants and makes them strong enough to withstand biting pressures, ready for the placement of the teeth. Your second trip to Lima is to restore the dental implants and place the teeth. This needs to be for a minimum period of three weeks to allow for the fabrication of your new teeth. This includes impressions, tests, bite alignment and final adjustments. There will normally be appointments every other day to advance step by step for this phase. Full mouth all on six dental implants treatment is much more accessible in Lima than in North America. You can expect to pay around half the cost of what you would pay at a quality dental clinic at home. However, for us to give you an idea of costs we need to see at least a panoramic x-ray scan to evaluate your case with our dentist.